The Figure 1 summarizes the HASDEL approach. The engineering teams capture the system architecture thanks to SLIM, a language very close from AADL. SLIM allows modelling the processors, the communication network, the devices (sensors and actuators), the software, etc… When needed, the electrical modes of the equipment (powered, not powered, booting…) and their functional modes are captured by timed finite state machines. The RAMS engineers complete thus this engineering model with specific timed error models and fault injections. 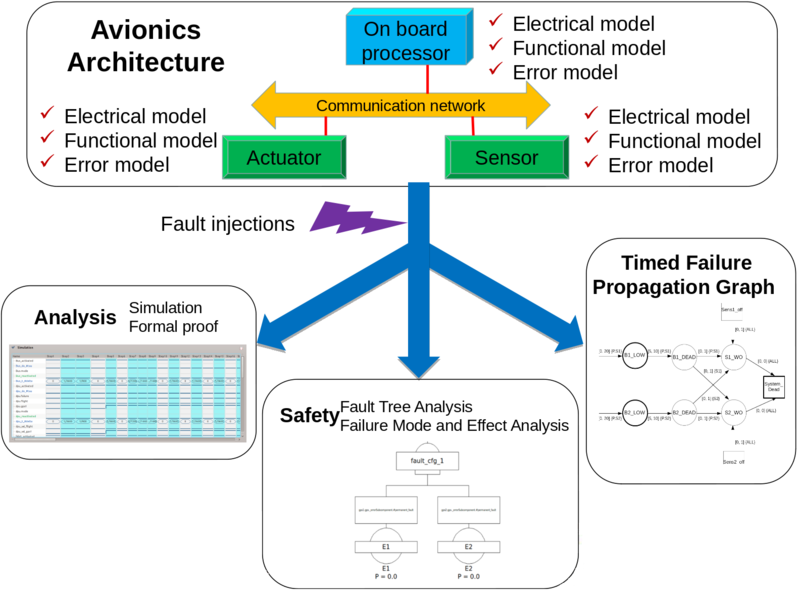 This model can then be used to perform RAMS analysis (thanks to model checking, formal proof, generation of timed failure propagation graphs, FTA, FMEA…). Loading of nominal and error models. The models are loaded through the COMPASS GUI. The nominal model identifies some parameters for modelling of FDIR, in particular: parameters that are visible for the FDIR component (observable) and the recovery actions (input events). Fault injection. It comprises the definition of one or more fault injections that describe how the error behaviour influences the nominal behaviour. Model Extension. The model extension is triggered automatically by the HASDEL toolset, when the fault injections have been defined. The result is an extended model which incorporates both nominal and error behaviour. TFPG Modelling/Synthesis. The System/RAMS Engineer can use a TFPG to model fault propagation in the system. 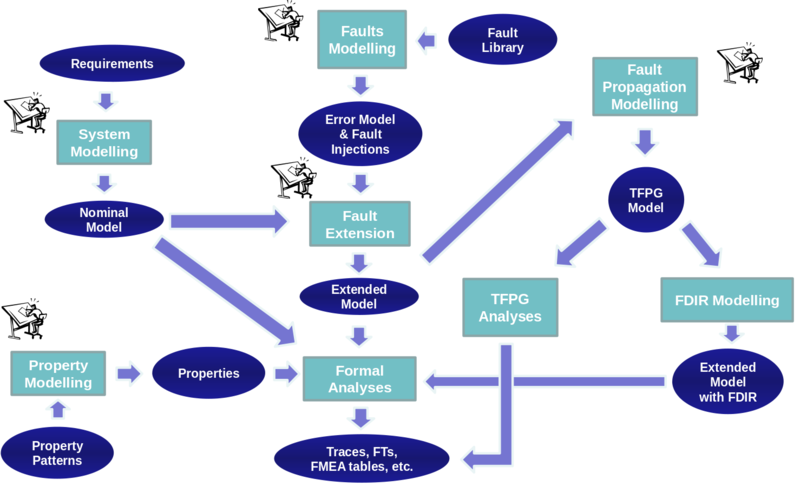 A TFPG is an abstract view of the extended model that focuses on fault propagation information. A TFPG can also be automatically synthesized by the HASDEL toolset. TFPG Validation. Whenever a TFPG is (manually) produced, it can be validated, in order to ensure that it is a correct abstraction of the system it refers to. In particular, it is possible to check whether it is defined on the vocabulary of the original system, if the behaviours of the original system are also admitted by the TFPG (and vice versa), and whether the TFPG contains enough information to diagnose all the faults that are of interest. FTs and FMEA tables, together with the original models, are used to model (and validate) a TFPG. The output of this activity also includes observability information for the original model.